The Independent Order of Good Templars was a temperance organisation – existing to promote tee-totalism -founded in the USA which spread to the UK in 1868 with its first lodge in Birmingham. The orphanage was set up in 1874 for the children of parents who were complete abstainers. In 1881, Mount Pleasant in Sunbury on Thames, which had been a private school, was bought for use as the Orphanage. It was evacuated during World War II. 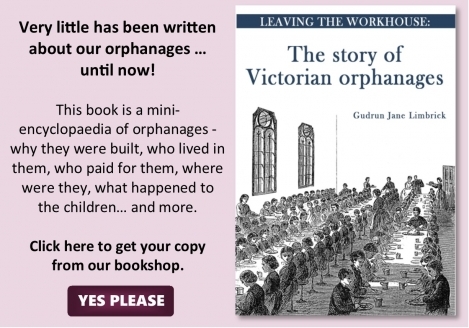 It seems that the orphanage had a national remit with children being taken in from all over the country and fundraising activities taking place in local temperance lodges far and wide. The following is taken from The Northern Temperance Year Book for 1894. This Institution was founded in 1875 to receive, maintain, clothe, and educate, orphan children, male and female, being children of Good Templars or other Total Abstainers from Intoxicating Drinks. It is now located at Sunbury-on-Thames, a pretty riverside village sixteen miles west of London, a favourite resort of boating parties and anglers. The building shewn in the accompanying sketch with about thirteen acres of freehold ground surrounding it, was purchased for the use of the Orphanage in 1881, at a cost of £5,000. Of this sum upwards of £2,000 remained unpaid at date of last Annual Report. Special efforts are being made this year to relieve the Orphanage from this burden of debt the interest payable upon which forms a considerable item in the expenditure annually. The management of the Institution is vested in a Board consisting of fifteen members, ten of whom are elected by the subscribers, and five nominated by the Grand Lodge of England, I.O.G.T. The Officers are: Chairman, Mr. Edward Wood J.P., Deputy Chairman, Capt Phipps, R.N., Treasurer, Mr. Froome Talfonrd, Hon. Sec, Mr. S. R. Rolfe. The other members of the board are earnest Temperance workers Messrs. Joseph Malins, John Kempster and William Sutherland being among them. Children are received from all parts of the country, the sixty now sheltered in the home representing 24 counties. All are members of the "Orphanage Rosebud" Juvenile Temple and the thoroughness of their Temperance training is shewn by the high positions attained by them in the Band of Hope and other Temperance Examinations. The Orphanage has no endowment, and depends entirely upon voluntary subscriptions. 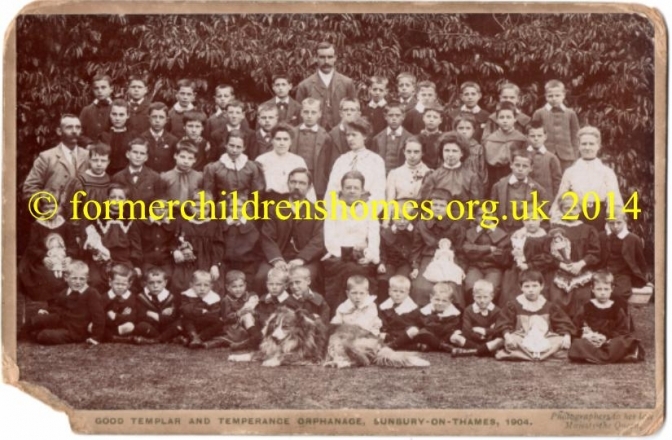 Although it does not restrict its benefits to the children of Good Templars but receives the orphans of Total Abstainers generally, irrespective of connection with any special Order or Society, it does not receive the recognition it deserves from the Temperance public. The Income of the last financial year was £1212 16s 9d and the Expenditure £1214 1s 2d. The receipts included nearly £800 collected and subscribed by Good Templar Lodges while of the remainder a comparatively small amount was received from outside the Order. This should not be. The Institution is worthy of general support and should not be forgotten or ignored by the Temperance public. A large room adjoining the main building is used for the school, which is in charge of a resident certificated mistress. The school is examined annually by H.M. Inspector whose reports are invariably very good, and the grants earned are above the maximum allowed by the Education Department. The schoolroom is not quite up to the modern standard, and funds are being raised for the erection of a more suitable building. Christmastide will soon be here. The time of rejoicing in the enjoyment of health and friends, and prosperity should not be allowed to pass without recollection of those not favoured so highly as ourselves. Will not the readers of these pages remember the children in this Institution. Many of them are the orphans of Temperance workers who did good service to the movement in days that are past. The Hon. Sec. will gladly receive subscriptions or donations, which should be sent to him at 45, Paulet Road, London, S.E. Presents of toys, books, fruit, provisions, or any articles useful in the household will be welcome, and should be sent direct to the Good Templar and Temperance Orphanage, Sunbury-on-Thames. of the School 1881 – 1920. Details can be found here (external site).